People have always loved using outdoor fire elements as relaxing gathering places for friends and family. In our Landscape with Stone 2016 Idea Book, it’s clear to see that unique fire features are currently a major outdoor living trend. 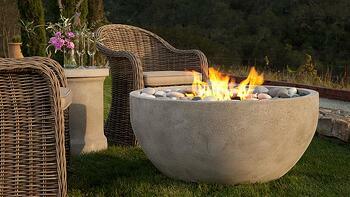 Now, Eldorado Outdoor has taken that concept to the next level with their handcrafted artisan fire bowls. Fire bowls add an affordable element of luxury to any landscape. With designs that compliment both traditional and modern landscape settings, the options are endless. Because of the simple yet elegant shapes, the fire bowls are at home in any setting, creating a functional yet beautiful focal point for peaceful evenings outdoors. 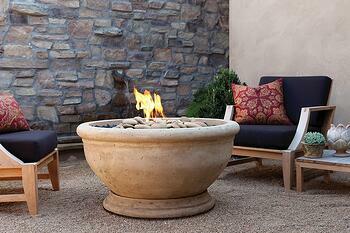 The versatility of these fire bowls makes them perfect for either residential or commercial settings. 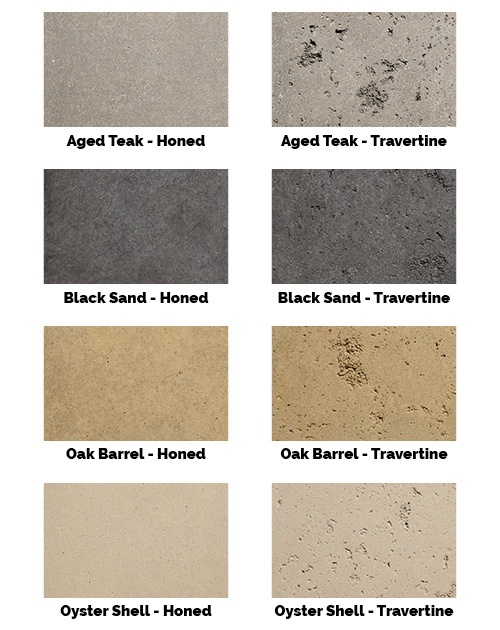 These popular landscape elements are available in a range of colors with a choice between a honed or travertine finish. Some are even available with a wooden cover, transforming the bowl into a practical table for daytime use as well as protecting it from the elements. Q: What are the fire bowls made of? 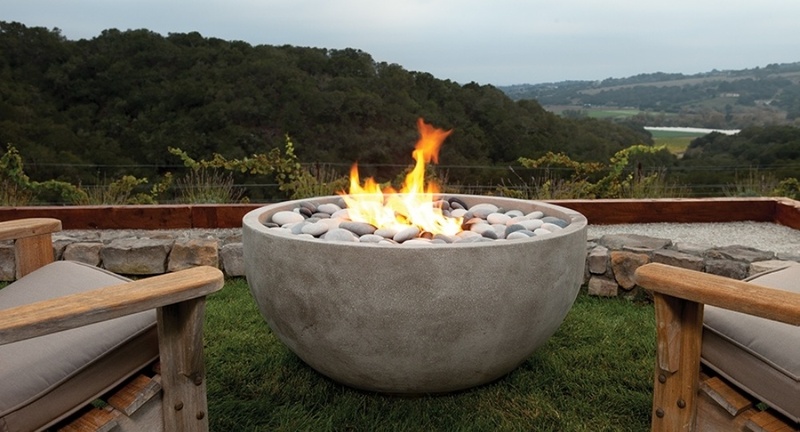 A: Each Eldorado fire bowl is made from strong glass-fiber reinforced concrete and is hand-finished with a thorough four-step process to give it the look and feel of natural limestone. Q: What kind of fuel is needed? 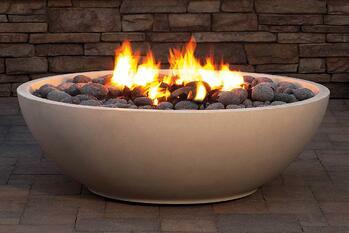 A: Eldorado fire bowls operate with either liquid propane or natural gas. Every style is available in either of these two options, so the choice of fuel is personal preference. A: Each fire bowl kit ships with everything needed for installation, including CAS-approved gas components, a 65,000 BTU 12” fire ring, black lava rocks, and an easy carry strap that allows two people to position the bowl. Q: How is it set up? Q: What color and finishing options are available? Q: What designs are available? Q: How much do Eldorado fire bowls cost? A: The cost varies depending on style and type of fuel selected, but the average price range for these products is usually $2,500 - $5,000. Typically the liquid propane fire bowls cost slightly more than the natural gas options. There are several basic steps for selecting the fire bowl that will work best for your application. First, decide on the location. The amount of space you have to work with may influence your size options. The largest available shape is Mezzaluna with a diameter of 48 inches. It’s also important that the appliance is placed on a flat surface somewhere it can be exposed to fresh air/ventilation. Next, choose your preferred style. Each of the three available designs has its own unique connotation. For example, the Marbella evokes a Romanesque feeling while the Mezzaluna has an air of luxury. Then choose the preferred color and finish. Again, each combination presents its own individual aesthetic. Finally, decide whether natural gas or liquid propane is the preferred fuel method. With the wide range of style possibilities and limitless applications, Eldorado artisan fire bowls are a game-changer for landscape design centered on outdoor living.